KickMaker is a synthesizer designed specifically to create good kick drum sounds. It uses four independent oscillators and a wide range of effects, allowing one to create perfectly customized beats. KickMaker is the perfect solution for producers who are tired of using factory samples or ordinary drum machines, and want an easy way to create a wide range kicks for their tracks. "Frequency Expander" effect available for each oscillator. This effect will start the oscillator at a higher frequency and drop the frequency to the originally tuned value. The end result creates a realistic "smack" noise that can be used to generate a wide range of kicks. Compression effect with variable attack, release, threshhold, and ratio parameters. 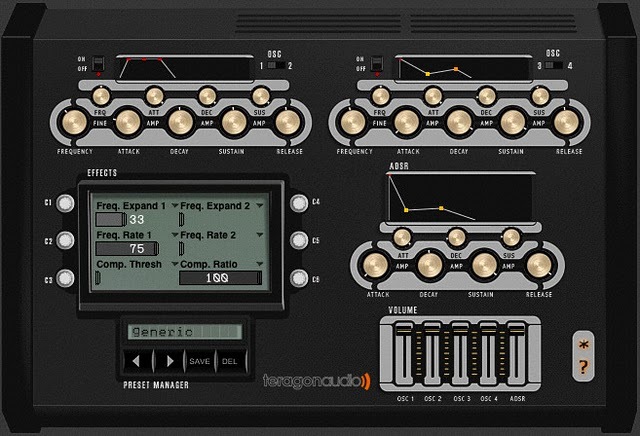 Convenient preset manager allows for one-click saving and deletion of presets, as well as scrolling through preset banks. Posted by Anonymous on Tue, 05/29/2012 - 02:02.